You already know that both you and your spouse need separate attorneys when you file for divorce, but do you know the hidden costs associated with the proceedings? Even if you both agree to a no fault divorce, which means that you agree to the proceedings, you still face some certain costs. Learning more about those costs can help you decide how much money you should put back. 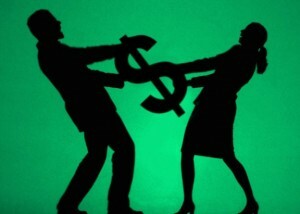 Spousal support typically comes into play when one person makes more than the other. If your wife agreed to stay home and raise the kids while you work, you’re responsible for spousal support. During the proceedings, the judge can also order one partner to pay for any costs that the other accumulates until the divorce is final. You might find yourself paying more than half of your paycheck every month to support your ex. Did you know that some courts can hold you financially responsible for the medical needs of your former partner and children? While most people don’t have a problem carrying their children on their health insurance policies, they don’t want to keep supporting their former partners. There is a chance that the court can order you to continue paying the medical bills of your ex. If you have one or more children and make more money than your ex, the court will likely require that you pay child support. The court can legally take up to 75 percent of your paycheck for support, but most courts look at the lifestyles of the children involved and the income of both partners before determining a child support order. Some parents only pay a small amount each week, while others pay thousands every month. Before you file for divorce, you and your partner might attempt marriage counseling, and some courts will recommend that you seek counseling during a legal separation. Counseling sessions can easily cost $100 or more per each session, and you might spend several hundred dollars a week out of your own pocket before you even file. Divorce is expensive, and if you make more money than your ex, the court will likely determine that you need to pay for spousal support and child support. You’ll also face high bills for marriage counseling, and you might payout even more for health insurance. Talking to a lawyer like Ronald S. Clement LLC Attorney At Law gives you a better chance to work out how much money you need to pay to file for divorce and how much money you’ll spend during the proceedings.